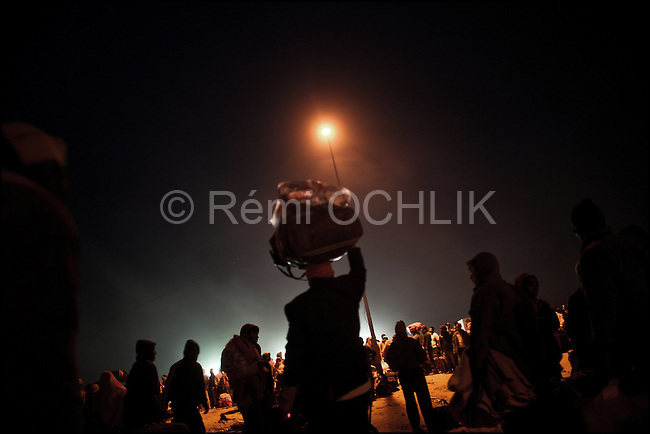 © Remi OCHLIK/IP3 - RA'AS AJADIR, Tunisia and Libyan border - March 3 -- At nightfall, hundreds of Bengladeshi workers refugees run to get on the buses which gonna drive them to the Choucha refugee camp. Some of them spend 3 days before getting a bus for the Choucha refugee camp...Desperate refugees continued to flow Thursday to Libya's border with Tunisia, where thousands anxiously waited to be taken home and aid workers warned of a humanitarian disaster. Waves of refugees -- mainly migrant workers from countries such as Egypt and Bangladesh -- have been fleeing Libya as fighting rages between opponents and loyalists of strongman leader Moamer Kadhafi. At Tunisia's border post at Ras Jedir, a few Tunisian police officers and soldiers were struggling to contain thousands of new arrivals, baggage held over their heads, desperate to leave Libya.